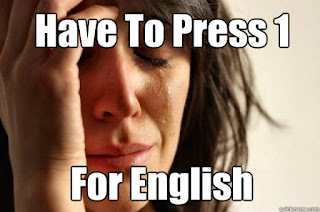 Thoughts from Polly's Granddaughter: "Press 1 for English" - The Ugly History Behind It. "Press 1 for English" - The Ugly History Behind It. First, I want to make it clear that I only speak English. I know a few Cherokee words, but do not speak the language. But, I am the first generation in the direct line of my Cherokee family to be born into a non-Cherokee speaking household. Everyone is probably aware of the "Press 1 for English" memes that are shared on facebook, passed around time and time again. Every time I see these shared by a fellow Cherokee, I wonder if they have forgotten our past and how many of our relatives and ancestors were forced to give up their native language for English. Emphasis on the word FORCED. When I see a Cherokee share something like any of the photos above, to me, it feels as if they are celebrating the near decimation of our own native Cherokee language by the colonizers who brought and forced the English language upon us. It is troublesome. 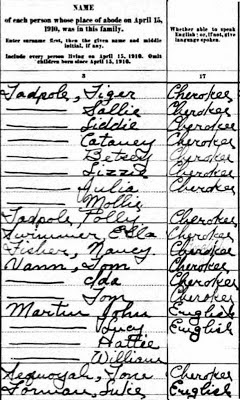 A little over one hundred years ago, my family was still speaking Cherokee, as shown on the 1910 US Census. All the people listed, from Tiger Tadpole down to Nancy Fisher, are my family members. Nancy was my great grandmother. The census specifically said, "Whether able to speak English; or if not, give language spoken." This means my Cherokee family was not able to speak English. From Ancestry.com - edited to show the names and languages spoken columns together. So what happened in the last one hundred years that caused my family to become an English speaking only family? 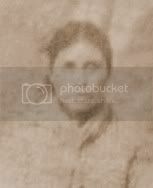 My mother was a product of the Indian boarding school system and only spoke English after leaving the schools. I know we live in America. 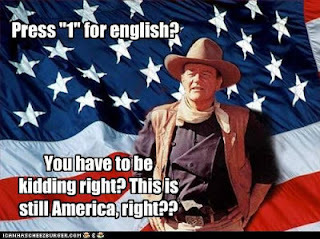 I know that English is the main language used, but I also know why American Indians primarily speak English now. It was not by choice, but instead, because of forced assimilation. According to "Enduring Voices", Oklahoma/Southwest U.S, is one of the "hotspot" areas in the world that has languages nearing extinction. The threat level is rated as high. Is the extinction of our indigenous languages something we want just so we don't have to "Press 1 for English"? 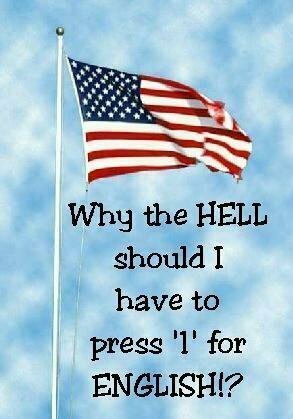 If you are Cherokee, the next time you complain about having to pressing 1 for English, stop and think about why you probably don't speak the language of your ancestors. 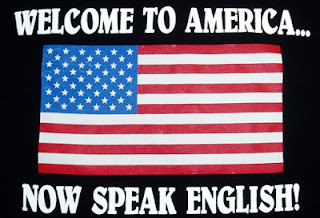 Our Cherokee ancestors did not immigrate to this land, willing to adopt a new language when they did. 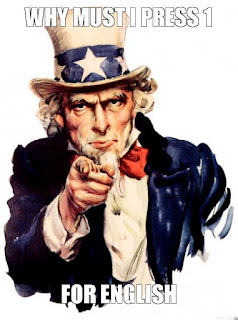 Instead, our ancestors and their nation were absorbed by the United States during the allotment period. Once that happened, the assimilation process began in full force. 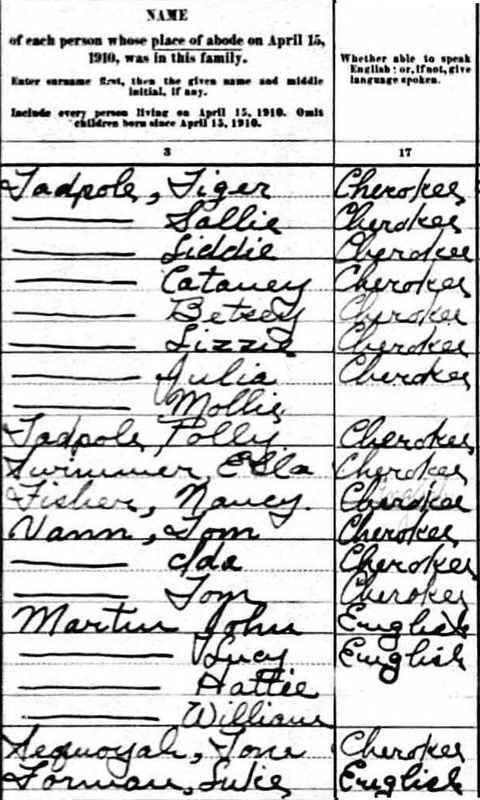 Many Cherokee families stopped teaching/speaking the Cherokee language to their children, especially if the children were sent to Indian boarding schools. This was an effort to protect those children from beatings or other punishments they received for speaking their native languages. This means many of our families gave up their native language out of fear. Not choice, but fear. 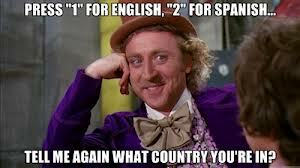 People who complain that the U.S. is not an English speaking only nation should remind us of our sad history. Their message is one of colonization and an example of dominant culture privilege. When Cherokees share the same sentiment, it shows "they" have done their job well. It means the assimilation process has been successful. It means Cherokees don't think like Cherokees anymore. It means we've forgotten our history. Cherokees, think before you demand the U.S. be an "English only" nation. Do not advocate for the forced assimilation we endured to be put onto others. Stop following the crowd and start thinking like a Cherokee. Remember our history. 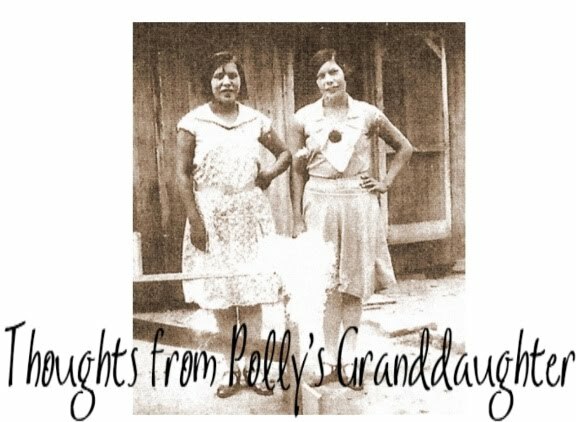 The loss of our language in many Cherokee families and the reasons behind it are a very ugly part of our history. But it is a part of our history that we should never forget. Twila Barnes, you always take the words out of my mouth but with eloquently and with grace. As I told you before, my father who went to ndn boarding school and is in late stages of Alzheimers will no longer speak English. It's heartbreaking because as the first generation that has English as a first language, I most of the time can't communicate with my own father. I am his only daughter and it upsets him. White devil at work. Thank you for your awareness,.understanding and sharing. You are a treasure.